Muxlab 500734 är ett kitt för att förlänga SDI signaler över en UTP nätverkskabel upp till 100 meter. Kittet har stöd för upplösningar upp till och med [email protected] och PoE, d.v.s att strömförsörjning genom nätverkskabel. 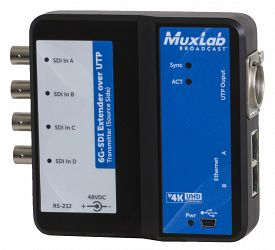 The 6G-SDI Extender over UTP is a unique solution from MuxLab for extending SDI cameras or other SDI sources up to 4K resolution at up to 330ft (100m) using standard Cat5e/6 UTP cable. 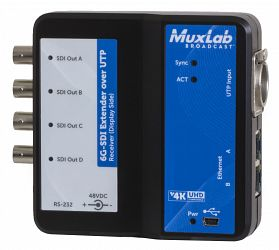 This multichannel extender supports up to 6Gbps of data throughput over the UTP link and allows for versatile combinations of sources, including one 6G-SDI source, two 3G-SDI sources or four HD-SDI sources, plus transmission of two Ethernet signals which may be used as return channels, and a bi-directional RS232 pass-through. The Ethernet port of the 500733 can be used for AV monitoring and talk-back, while the RS232 pass-through supports return of tally light, camera control unit (CCU) and control of end devices. 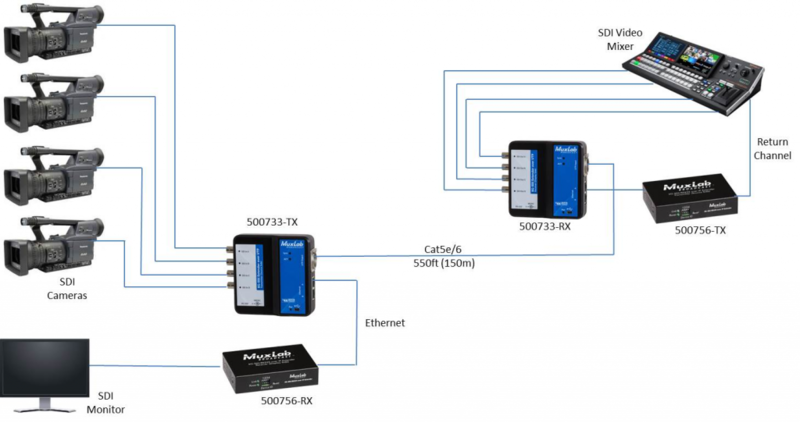 The 6G-SDI Extender supports PoE, whereby the Transmitter may be powered by the Receiver. In addition Ethernet port1 also provides PoE power (PSE) in order to power an attached PoE (PD) device, such as a MuxLab Over IP PoE Transmitter or Receiver.